Eighty years after it originated in the United States, the midcentury tiki craze has revealed itself to be much more than just a passing fad. From “Mad Men” to modernism, the current fascination with all things midcentury has brought a variety of once-forgotten trends back into the limelight. The most interesting of all just might be tiki, a tropically inspired pop culture phenomenon that reached its heyday in the 1950s. Yet decades after its initial popularity peaked, misconceptions still exist about the tiki movement. Despite being loosely based on Polynesian culture, for one, it’s actually as all-American as baseball and Coca-Cola. While most people today think of tiki in terms of the tropical cocktails it introduced to bar menus across the country—strong blends of light or dark rum, fresh fruit juices, and flavored syrups and liqueurs—they might be surprised to find out those same drinks are derived from Caribbean recipes created centuries ago. Luckily, a dedicated community of self-described “tikiphiles,” historians and bartenders endeavor to set the record straight on tiki culture while securing its status as a viable art form with enough steam to carry it into the 21st century. Tracing the origins of tiki culture requires an understanding of a very specific era in American history: the first half of the 20th century. Following the national repeal of Prohibition in 1933, Americans began to experiment with more complicated cocktail blends. They mixed fresh fruit juices and handcrafted liqueurs and bitters with potent spirits thus creating some of the first examples of what contemporary mixologists now refer to as culinary craft cocktails. Simultaneously, another form of entertainment, the picture show, had mushroomed into a full-fledged industry, introducing moviegoers to the kinds of far-flung places they’d previously only imagined. Capitalizing on the public’s interest in Polynesian exploration, Ernest Raymond Beaumont Gantt, more commonly known as Don the Beachcomber, opened a cafe in Hollywood in 1934, serving rum-based cocktails, including the Zombie, alongside a selection of Cantonese dishes. Gantt decorated his lounge with wicker furnishings, floating glass lights and hand-carved statues, and would eventually develop a lucrative side business renting out some of his pieces to movie studios. 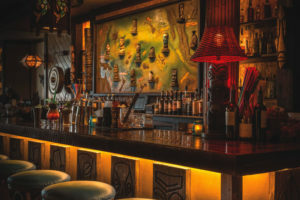 Later, many Southern California-based tiki bar owners—including Gantt’s main competitor, Trader Vic’s founder Victor Bergeron—would form collaborative relationships with film industry workers, hiring art directors and set designers to furnish their bars with accents such as full-size canoes and working waterfalls. 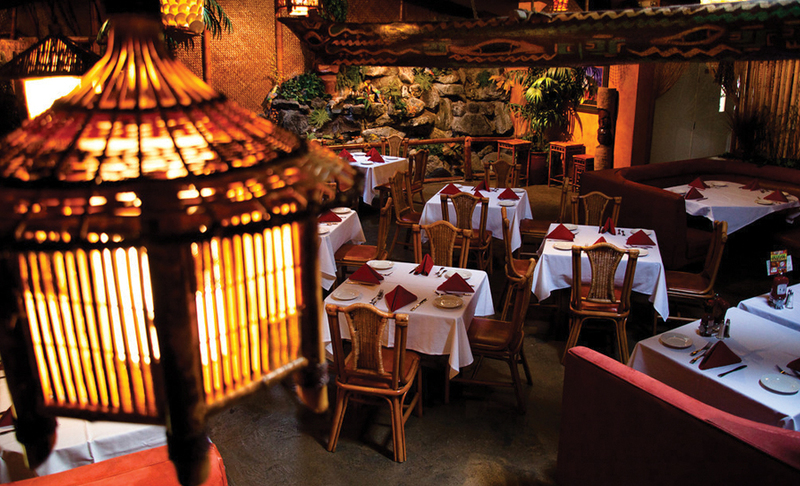 Within just a few years, tiki fever had reached an all-time high, influencing everything from restaurant and bar design to the architecture of motels, apartment buildings and bowling alleys. It wasn’t until the dawn of World War II, though, that much of the American public came face to face with the foreign lands of the South Pacific for the very first time. As soldiers returned to domestic soil, they brought with them detailed memories of lush places beyond the sea. Americans’ fantasies of what they considered an untamed topography and culture became a form of escapism—a perfect dichotomy to the structure of a middle-class life in the suburbs and the nuclear family, according to Sven Kirsten, a cinematographer and self-described “urban archaeologist.” Kirsten has studied tiki culture since the 1980s and authored several Taschen-published books on the subject, including “The Book of Tiki” (2000), “Tiki Style” (2004) and “Tiki Pop” (2014). at-home cocktail hours, tropical interior decor and apparel, and even a new genre of orchestral music, exotica, to get their tiki fix. Perhaps not surprisingly, the era also coincided with the granting of statehood to the Hawaiian Islands in 1959. Still, even tiki couldn’t survive the changing tides of the late 1960s. By the mid-1970s, tiki culture had fallen almost completely out of favor with younger generations—especially the more traveled and politically conscious baby boomers—and the majority of the country’s tiki bars closed their doors. Tiki ephemera, meanwhile, was relegated to garage sales and pawnshops, only to be rediscovered decades later. It wasn’t until the mid-1980s that tiki “artifacts”—think mugs, menus and matchbooks—began to resurface in secondhand stores, particularly in areas that had been home to larger concentrations of tiki-themed bars and restaurants. In cities like Los Angeles, Kirsten and one of his neighbors, Jeff “Beachbum” Berry, began snatching up as much tiki memorabilia as they could find. Berry took things in an entirely new direction by collecting the vintage drink recipes that elevated tiki into a cocktail movement. Over time, Berry began to unearth vintage tiki recipes in the Los Angeles area, but the growth of the Internet took his treasure hunt across the country. “People who were the wives, children and grandchildren of some of these bartenders had their old recipe books, and they’d find me or I’d find them,” he says. “A lot of the old books were just in shoe boxes or file cabinets.” Before long, Berry had compiled his findings into his first book, “Beachbum Berry’s Grog Log” (1998), which further galvanized the tiki revival. “Jeff Berry’s books did a lot to bring tiki back into the mainstream again,” Kirsten remarks. “And then craft cocktailing gave the whole tiki movement a major push.” A 180-degree departure from the drink-making styles of the 1980s that prioritized cheap spirits and canned juices above all else, the craft-cocktail movement that originated in the early 2000s and continues today is all about freshness—a concept that dovetails beautifully with the format of the traditional tiki drink. “Very soon [after the publication of the “Grog Log”], bartenders started to play with the old tiki formulas, as they should,” Berry says. “It’s what Don the Beachcomber and Trader Vic did in the 1930s, when they improved upon Caribbean drinks like the planter’s punch. A lot of ingredients were coming into play that weren’t available back in the 1930s through 1950s—new spirits, exotic fruits and bitters.” For contemporary cocktail enthusiasts, the combination was irresistible. 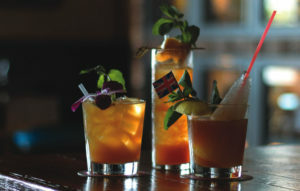 Part of the appeal, Reynolds says, has to do with the inherent flexibility involved in making tiki cocktails. “There’s copious room for experimentation in tiki cocktailing because the formulations of these drinks are open to interpretation,” he continues. “Tiki drinks typically find their origin in a drink called the planter’s punch—just remember ‘one of sour, two of sweet, three of strong, four of weak.’ All different combinations of that simple formula can be used to create a tiki drink, but so many more ingredients are available now, including fresh fruits such as mangoes and kiwis, which weren’t available in the 1950s. 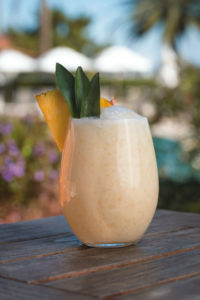 Sea Island Director of Wines and Spirits Ryanne Carrier shares the resort’s recipe for a tiki cocktail classic. On the rocks: Combine all ingredients in a shaker with ice. Shake and strain into a glass with crushed ice. Frozen: Fill an empty quart container half full with crushed ice. Add all cocktail ingredients and blend for 5 to 7 seconds.